* in order to make this packet get counted in tcpOutSegs. *	all states except ESTABLISHED and TIME_WAIT. 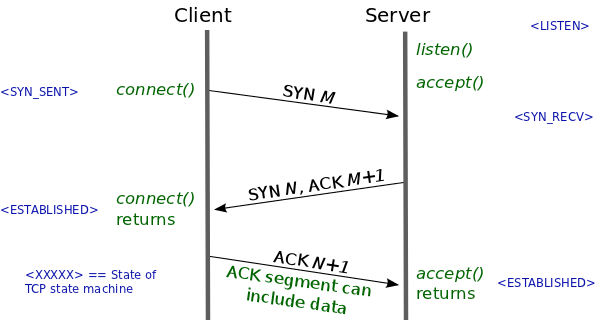 *        the segment and return)"
/* Now ACK is acceptable. *    delete TCB, and return." *    drop the segment and return." /* Remember, tcp_poll() does not lock socket! * several ticks, if write_pending is set. *      Otherwise (no ACK) drop the segment and return." * simultaneous connect with crossed SYNs. * Particularly, it can be connect to self. /* Note, we could accept data and URG from this segment. * before 3WHS completes per RFC793, or employ TCP Fast Open). * we have no reasons to accept it sometimes. * is not flawless. So, discard packet for sanity. * Uncomment this return to process the data. * drop the segment and return."